Out of the twenty colleges or 100 teams who vied to be the Next Big Sandwich Hit Champion, Philippine Women’s University’s Team D’Pidabest was named as the champion on this year’s Gardenia's annual cook-off challenge. 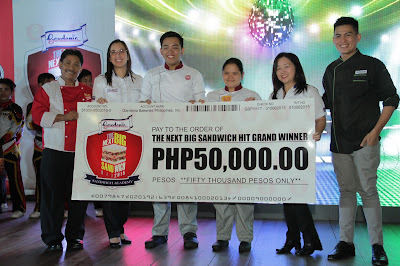 On its 3rd year, Gardenia made an even bigger competition with 100 teams in total (5 teams each) from 20 colleges and universities all over Luzon on its annual cook-off and sandwich making competition - Next Big Sandwich Hit. This year’s competition was divided into three parts, the School Hop Phase/Elimination Round, the Business Implementation Phase, and the Finale. For this year’s elimination round, 10 themes were used as basis for the recipes that the students should come up with: Bread & Breakfast; Lunch Out; Dinner Affair; Workout Boost; After School Merienda; Midnight Hacks; Pica Picks; Sweet Escape; Study Buddy; and Break time Fix. 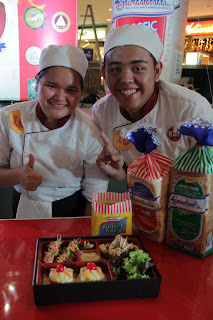 Each team was also asked to come up with 2 recipes for the given theme: a school spirit recipe and a price challenge recipe, which should have cost of not more than Php 35.00 per serving. For the Business Implementation Phase, students were given the chance to test the marketability of their sandwich so they can get a glimpse of actual industry practice. Jod Michelle Jacinto and Juan Carlo Caparas of PWU’s Team D’Pidabest Duo took home a total prize package of Php 50,000, while John Lustre Pestin and Adryx Ivan Rafols of La Consolacion College Manila’s Team Funtoastic’s won second place with a prize of Php 30,000 prize package while Elaine Francisco and Ramon Eloriaga of Manila Tytana Colleges’ Team Lubdub’s grabbed the third spot and Php 20,000 worth of prizes. Celebrity Chef Jeremy Favia and Gardenia’s resident chef, Benjo Fundales, also graced the gathering through a cooking demo and lecture that were enjoyed by spectators. Of course, these spectators also had a fun time experimenting their own sandwiches through Gardenia Sandwich Game Truck (a sandwich-making touch screen game). Other participating universities are Tarlac State University, Centro Escolar University Malolos, Angeles University Foundation, De La Salle University Dasmariñas, Cavite State University, University of the East (Manila), University of Manila, National University, Adamson University, St. Paul University Manila, University of the Cordilleras, Benguet State University, Malayan Colleges Laguna, University of Sto. Tomas, Laguna State Polytechnic University, Arellano University and Polytechnic University of the Philippines.